The German-American Brass Band is So. California’s premier German brass band. Modelled after an authentic German Blaskapelle (the type of brass band that you’d find in the villages and towns of Germany, Austria, and throughout central Europe - and of course at the Oktoberfest! ), the band performs traditional and contemporary festival and dance music. It has been an audience favorite since 1962, and has performed for numerous events and festivals including yearly events sponsored by the Danube-Swabian Association and the German-American League of Los Angeles, and Oktoberfests in Big Bear, Lake Arrowhead, Cathedral City, Old World, Alpine Village, Phoenix Club, and the yearly Montrose-Verdugo Oktoberfest. The band maintains an extensive library of authentic German music that reflects the entire spectrum of the German speaking regions of Europe. Its performance groups range from 17 to 25 (or more) musicians, and the size of the band can be tailored to meet event requirements. Whenever the band performs, it creates the authentic feel of a European Volksfest and brings the feel-good music of a real brass band to every occasion. 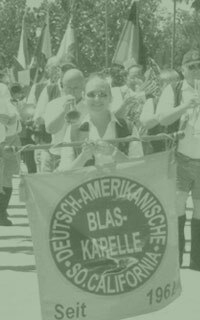 The German-American Brass Band is available to perform for your social, corporate, civic, or cultural event. For more information or to schedule a performance, please contact us.